Table Talk with C and C: May Goals Linky Party! MAY?!?! Can you believe it??? I don't even know where the time has gone! 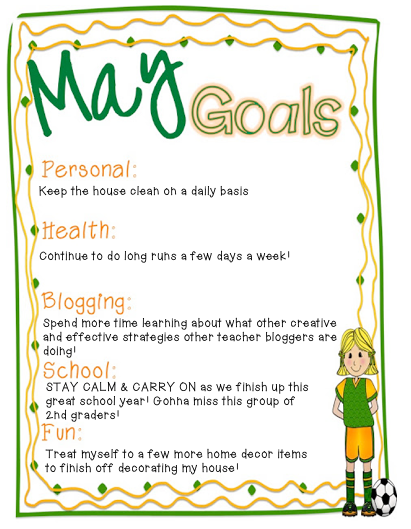 Today I am linking with Jen from I (heart) Recess for her May Goals Linky Party to share a little bit about my goals for this last month of school! The end of the year testing can be stressful on teachers and students. I know I find it hard trying to keep them settled and focused when they know the end is soon approaching and the weather is awesome outside. Congratulations on your one year home owner anniversary! Staying calm this time of year is very difficult, great goal to have! Thanks for linking up!